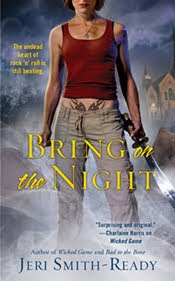 Jeri Smith-Ready: BRING ON THE NIGHT a Goodreads Choice nominee! BRING ON THE NIGHT a Goodreads Choice nominee! One of my awesome Facebook friends informed me last week (or maybe the week before, it's hard to keep track) that Bring on the Night is a nominee for a Goodreads Choice Award, for Best Paranormal Fantasy! I was pretty blown away by this, especially considering the caliber of my fellow nominees. You can go vote for your favorite here. Not that I have any chance of winning against the likes of Joe Hill, Charlaine Harris, and Laurell K. Hamilton, but hey, I'd be thrilled with sixth runner up. And a very big thanks to whoever is responsible for this nomination. It was unexpected, to say the least! Giveaways, chats, booksignings, oh MY! NoMoEmo is here! Join me if you dare!